petition: 8 Years after BP's Gulf Disaster, Sick Workers Are Still Not Being Cared For. Demand Their Day in Court! 8 Years after BP's Gulf Disaster, Sick Workers Are Still Not Being Cared For. Demand Their Day in Court! Do you remember what happened on April 20, 2010? Too many people are still suffering in the aftermath of the BP drilling disaster in the Gulf of Mexico, while a big corporation and powerful attorneys walk away with barges of cash, ignoring the victims left behind. This was a devastating and shameful event caused by the greed of a corporation as well as the negligence and greed of politicians, powerful attorneys and so-called administrators for those impacted by the largest single oil spill in America's history. Recently released health studies confirmed that those closest to the BP disaster were made sick by their exposure to oil and dispersants. 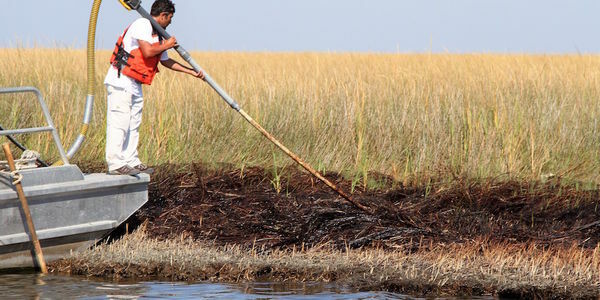 Many cleanup workers and spill-impact-zone residents are developing cancer, blood diseases, and neurologic problems, conditions that have been proven to follow previous oil spills, caused by exposure to these toxic chemicals. Cleanup workers were not provided with or required to wear the safety equipment that would have protected them from illness, such as respirators, gloves, boots, Tyvek suits and similar protective gear. 80% of those who submitted a health claim were either denied or only given the bare minimum compensation – only 40 claims (out of 37,226) for compensation for a chronic condition were paid. Many people who are sick with chronic conditions are being forced to file an individual lawsuit against BP and pay a $400 filing fee to do so. 8 years after the spill, none of these claimants have been able to present their evidence to a jury. Those who opted out of the settlement have fared no better, because Judge Carl Barbier has allowed these cases to be stayed indefinitely. It is frightfully unamerican for a person who was injured by BP, a big corporation who was admittedly negligent, to be denied their day in Court, while the Plaintiff's Steering Committee and the Claims Administrators walk off with hundreds of millions of dollars. The Plaintiff Steering Committee walked away with $700 million; the Claims Administrator, in charge of processing the first round of payments to victims, walked away with $155 million dollars. The total paid to all victims? A single lump sum of $60 million…even while those paid from the $60 million are only a small fraction of the injured people who helped in the cleanup or lived in the designated zones. My anger is focused on this miscarriage of justice and will not end until the victims are compensated. The suffering and silence has gone on long enough. Please join me in letting BP, the Court, and the Plaintiff Steering Committee know that we won't put up with it any longer. Let's make our voices heard. Join me as we speak for our families, friends, and neighbors who are victims of this tragedy. We're closing in on 60K signatures demanding the courts and BP take care of the workers they've left behind. Thank you for supporting this effort. Please share the petition to generate more pressure and attention. For more information, read this powerful story of our event outside the federal courthouse last week. As I said to the press: It's a crying damn shame.